It makes sense, if you are injured in the head at work  you werent wearing a hard hat! In 1980, Bureau of Labor Statistics (BLS) conducted a survey that indicated that about 80% of the workers sustaining traumatic head injuries each year do not wear head protection. Most of those injured were performing their normal jobs at their regular worksites with 70% indicating that they had had no instruction concerning hard hats. With this information, OSHA started the process to revise the PPE (personal protective equipment) standards and in 1994, the current version of the OSHA PPE standards was published. in 2010 OSHA handed out over $ 1.2 million in proposed penalties for about 2,000 head protection violations ( 29 CFR 1926.100 and 29 CFR 1910.135 ). Most of these violations were for workers failing to wear hard hats when required. When are hard hats required to be worn? The Simple Answer: If you are working where ANYTHING MIGHT fall, drop, fly, splash, or land on your head OR your head could come into contact with ANYTHING that MIGHT injure you, like moving equipment, chemicals or electricity, you need to be correctly wearing a properly fitting, ANSI-approved hardhat. All hard hats should have an ANSI certification label on the inside of the hard hats shell. This label will clearly identify what type and class standards it was designed to meet. If this label is missing or cannot be read it should be replaced. Hard hats are classified according to the specific impact and electrical performance requirements they meet. The details are specified in ANSI Z89.1-2009, American National Standard for Personal ProtectionProtective Headwear for Industrial Workers. Wearing them correctly means in accordance with the manufacturers recommendations. Not backwards (unless specifically so designed) and no hats underneath (except a proper hardhat liner). A hard hat works by the shell deflecting the blow and absorbing shock and distributing the force of the impact over the suspension system. Wear it backwards or wearing hats (especially baseball caps) or carrying something inside is a really bad idea as it can adversely affect the way it works. Any stickers on the hat must be removable so the hard hat can be inspected and no paint is allowed. If you are an employer you must determine if and when hard hats are required, provide the correct type and enforce their use. All hard hats dont protect our heads from all hazards! How do you choose the right hard hat? Do you need protection from just impact or do you also need protection from electrical hazards as well? 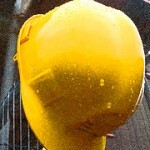 Type I hard hats are intended to reduce the force of impact resulting for a blow to the top of the head only.